Target 1 FIRE monster you control and 1 FIRE monster in your Graveyard; destroy that monster you control, and if you do, Special Summon that other monster from your Graveyard. You can only activate 1 "Circle of the Fire Kings" per turn. This card could be referring to the rebirth of the creature phoenix. This artwork shows a baby version of Fire King High Avatar Garunix appear being born out of its deceased adult body. However, this card's effect does not actually revive the same monster that is destroyed. This card cannot be activated during the Damage Step. If at the time of the resolution of the effect of "Circle of the Fire Kings" the targeted FIRE monster in the Graveyard is no longer in the Graveyard, the destruction of the targeted FIRE monster on the field is still performed, but the FIRE monster in the Graveyard is not Special Summoned. : If at the time of the resolution of the effect of "Circle of the Fire Kings" the targeted FIRE monster in the Graveyard is no longer in the Graveyard, is the targeted FIRE monster on the field still destroyed? 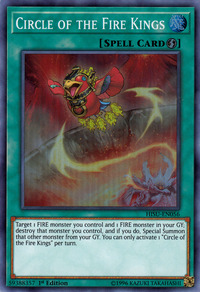 If the FIRE monster you control that is targeted for the effect of "Circle of the Fire Kings" is affected by the effect of "Forbidden Dress" so that it cannot be destroyed by card effects, the effect of "Circle of the Fire Kings" is not applied and the monster in the Graveyard is not Special Summoned. : If the FIRE monster you control that is targeted for the effect of "Circle of the Fire Kings" is affected by the effect of "Forbidden Dress" so that it cannot be destroyed by card effects, is the targeted monster in the Graveyard still Special Summoned? Even if "Book of Moon" is chained to the activation of "Circle of the Fire Kings" targeting the same FIRE monster as "Circle of the Fire Kings", so that at the time of the resolution of "Circle of the Fire Kings" the target has been flipped face-down, the effect of "Circle of the Fire Kings" resolves normally. : If "Book of Moon" is chained to the activation of "Circle of the Fire Kings" targeting the same FIRE monster as "Circle of the Fire Kings", so that at the time of the resolution of "Circle of the Fire Kings" the target has been flipped face-down, how does the effect of "Circle of the Fire Kings" resolve? If "Compulsory Evacuation Device" is chained to the activation of "Circle of the Fire Kings" targeting the same FIRE monster as "Circle of the Fire Kings", so that at the time of the resolution of "Circle of the Fire Kings" the target has left the field, the effect of "Circle of the Fire Kings" is not applied. (The targeted monster in the Graveyard is not Special Summoned. ): If "Compulsory Evacuation Device" is chained to the activation of "Circle of the Fire Kings" targeting the same FIRE monster as "Circle of the Fire Kings", so that at the time of the resolution of "Circle of the Fire Kings" the target has left the field, how does the effect of "Circle of the Fire Kings" resolve?